SAN DIEGO — May 21, 2018 — Sony Electronics Inc. continues to expand and enhance its Digital Paper product offering with the release of a new “notebook-sized” 10-inch model. The new model (DPT-CP1) gives customers the same high-performance reading, annotating and note-taking capabilities they have enjoyed with the original 13-inch letter-sized Digital Paper (DPT-RP1). Taking into consideration recommendations from customers and the company’s intent to continuously improve the overall experience, Sony is pleased to announce the new Digital Paper Mobile Application, as well as additional feature enhancements applicable to both the new 10-inch, notebook-size DPT-CP1 and the current 13-inch, letter-sized DPT-RP1. Sony’s free mobile app (for Android and IOS) enables users to transfer files to and from Digital Paper anywhere, without the need of a computer. It offers quick and easy access to their documents and notes—making both models even more productive and essential for on-the-go professionals and students. The app will be available in June 2018 from both Google Play (Android) and the Apple App Store (IOS). The addition of the mobile app and feature enhancements promotes integration of Digital Paper into customers’ day-to-day lives, helping to reduce volumes of documents and notes, and advancing their quest to achieve a truly paperless workflow. Sony Digital Paper Mobile Application – Smartphone companion app for Android and IOS for easy, convenient transfer of documents, forms and notes. Screen Capture/Display Output Mode – Connect via PC or Mac to a projector and display the contents on the Digital Paper screen to a larger audience, including real-time handwriting and mark-up. Interactive PDF and Smart Forms – Populate forms using drop down menus, checkboxes and radio buttons for easy, structured data capture. Page Jump – Enter a page number and go directly to that specific page. Pan and Zoom – Move the display area after a page or portion of the page has been enlarged. Automatic Page Rotation – Each page of a document, book or article is shown based on its aspect ratio to optimize the reading experience. Page Thumbnails Mode – View up to 16 pages at one time, including the page numbers of a document, book or article. Paper-like display – Glare-free display is ideal for long-term, immersive reading, even in direct sunlight. Thin and lightweight – Each model is 0.23 inches thick, weighing only 8.5 ounces for the 10-inch, 12.3 ounces for the 13 inch. Realistic writing feel – Digital Paper gives users the “feel” of writing on paper because of its non-slip panel. Two kinds of stylus tips are included, providing the choice of a pen-like or pencil-like experience. Generous storage – 16GB of internal memory (11GB usable) lets users carry and access up to 10,000 PDF documents. Auto save – Annotations and hand-written notes are automatically saved to internal memory and easily searchable. Print to Digital Paper – Convert any open web page or file (e.g., MS Word, MS Excel, MS PowerPoint, Apple Notes/Pages/Numbers) to PDF, and instantly save to Digital Paper. Long-lasting battery – On a single charge, lithium ion battery enables use for up to one week with Wi-Fi/Bluetooth turned on, and up to three weeks with Wi-Fi/Bluetooth turned off. Digital Paper continues to evolve. 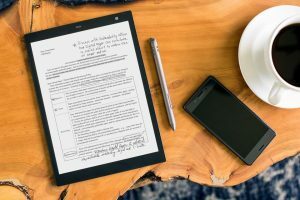 Sony’s goal is to give customers that natural and familiar experience of reading, annotating and note-taking while enabling many to achieve a paperless workflow. Sony believes the choice of two models, the availability of the mobile app, and useful new features will broaden the appeal of Digital Paper and build upon the strong satisfaction expressed by customers to date. The new 10-inch notebook-sized Digital Paper (DPT-CP1) is currently available for presale, priced at $599.99. For information on where to buy Digital Paper, please visit www.sony.com/digitalpaper. For information on how to obtain the mobile app and feature enhancements, please visit https://esupport.sony.com/info/1805. The firmware enabling the feature enhancements will be available for download beginning on May 30, 2018. USB connection required to install Digital Paper Application. Digital Paper Application required to transfer and/or sync files with PC or Mac. Digital Paper mobile app (Android, IOS) required to transfer and/or sync files with smartphone devices. Account registration and fees may apply to app and/or cloud services. Interoperability and compatibility among Bluetooth® devices vary. Requires Digital Paper Application (for Windows, Mac). Establish communication path (via USB, Bluetooth, or Wi-Fi) between Digital Paper and any computer which is connected to the overhead projection system. 16 GB total memory with a portion used for data management functions. 11 GB usable memory (1 GB = 1 billion bytes). For Windows 10 and Mac users. Actual performance varies based on settings, environmental conditions, and usage. Extensive handwriting and/or continuous connection with Bluetooth or Wi-Fi will draw more power and require more frequent charging.